Providing RF free environment for testing electronic equipment. 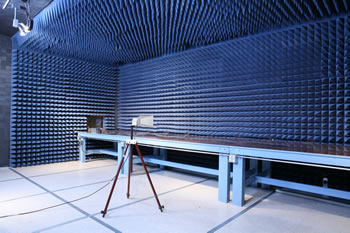 Anechoic chamber provides a RF free environment for testing electronic equipment to insure compliance with international standards for RF emissions and immunity levels.Our facilities allow engineers to develop products and systems that will function correctly in the electromagnetically rich world at large, assuring safety and compatibility. The chamber is constructed using the panabolt modular panel RF shielding system that provides high level RF shielding integrity, suitable for EMC testing to various standards specifically MIL STD 461E.